. 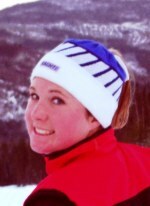 : Erika Langman :: Ski XCOttawa.ca :: Skiing in Ottawa and Gatineau Park :. Erika is a former high school racer originally from Orangeville, Ontario and is currently a third year commerce student at Carleton University. She has been racing with Carleton's nordic team for the past two years. Her results include at 7th place finish in the sprints at the 2005 Junior National Championships, being a member of the CCUNC gold medal relay team at 2004 National Championships, and a member of the silver medal relay team at the 2005 National Championships. When she's not out training for next year's season you'll find her tearing up the hills on her snowboard, turning a few inverts on her wakeboard or alongside Eva dancing her heart out. She's full of energy and has quite the ability to have a little too much fun at National Championships.. but hey, who doesn't! Welcome aboard Miss Langman.